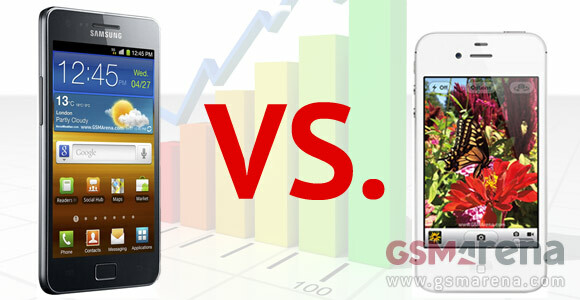 It wasn't actually a secret that Samsung has surpassed Apple in smartphone shipments for Q3 2011, but now the research firm IDC has confirmed just that. Samsung is now the smartphone king, putting Apple in second place, and Nokia in third. Put into perspective, 20 percent of all the smartphones in the world are Samsung branded, which is a huge leap over last years' 8.8 percent. In contrast, Apple has dropped its smartphone share from 17 percent to 15 percent, and Nokia has been doing even worse, dropping from 28 percent to just 14 percent. Speaking in raw numbers, Samsung has shipped 23.6 million smartphones, while Apple managed to ship 17.1 million units for the same period. The Taiwan based HTC managed to score in the top five for the first time in its history with a rise in shipments from 7.1 percent to 11 percent in just a year. Ramon Llamas, senior research analyst at IDC also put his thoughts on the results. "Samsung’s position will be a challenge to maintain. Apple’s fourth-quarter launch of the iPhone 4S and lower pricing of older models will certainly boost volumes, and Nokia’s recent launch of Windows Phone smartphones marks the beginning of a new era for the company. Do you think Samsung will be able to keep its position at the top or Apple, HTC or Nokia will manage to push it off the top of the charts?